You've probably seen it in hotels - the huge stack of towels over your toilet that helps to free up wall space and keeps linens in close reach to the shower. If it's good enough for a hotel, it can probably work in your bathroom! According to Better Homes and Gardens, combining overhead shelving with towel racks can free up space to accommodate other decorative accents. When choosing new shelving for your space, a good rule of thumb is to match it with your sink's faucets and dials. 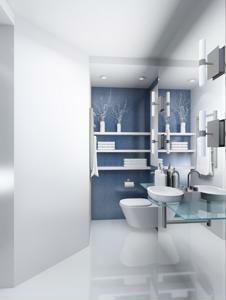 If you have chrome bathroom fixtures, chances are, a similar shelving design will help create a streamlined look. If open shelves aren't your cup of tea, you can always add a compact linen cabinet that can pair easily with your color scheme. However, be sure to leave enough clearance above the toilet to be able to remove the tank lid to perform any maintenance. Space always seems to be at a premium in bathrooms, so you may have to get a bit creative. What storage tips do you have for those redesigning their bathrooms?